A quick reference to help determine the best method of prototyping for different stages of product development. Prototyping is used to demonstrate or prove aspects of a design throughout the development process. Prototyping enables communication, validation and verification of a physical concept before the product is manufactured. Prototypes and models play a critical role in successfully getting products to market. They allow for faster iterations, more accurate product tests, stronger design evaluations, and more. Choosing the right prototyping method is key to your product’s success. The Periodic Table is one of the foundational references of modern science and an indispensable tool when it comes to understanding and organizing the known elements. Wouldn’t it be amazing if such a tool existed for arranging and understanding the many different ways a prototype could be created? There are many methods and materials for producing prototypes. Understanding their use is critical for product development. 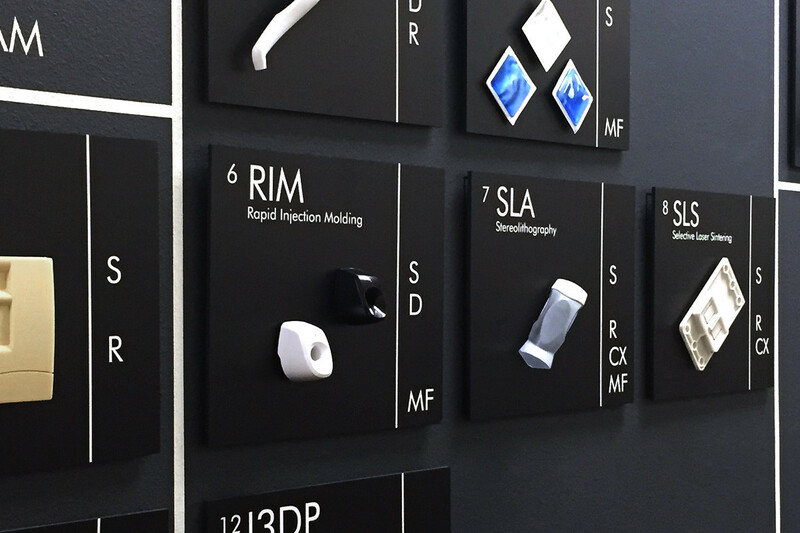 The wait is over – behold, The bb7 Periodic Table of Prototypes. Determining which method of prototyping is best for each stage of product development can be overwhelming; but it doesn’t have to be a struggle if you understand your needs and options. There are many processes available, each with there own pros and cons. The bb7 Periodic Table of Prototypes has been arranged to help you select the best process based on the attributes you are looking to have in your desired prototype. 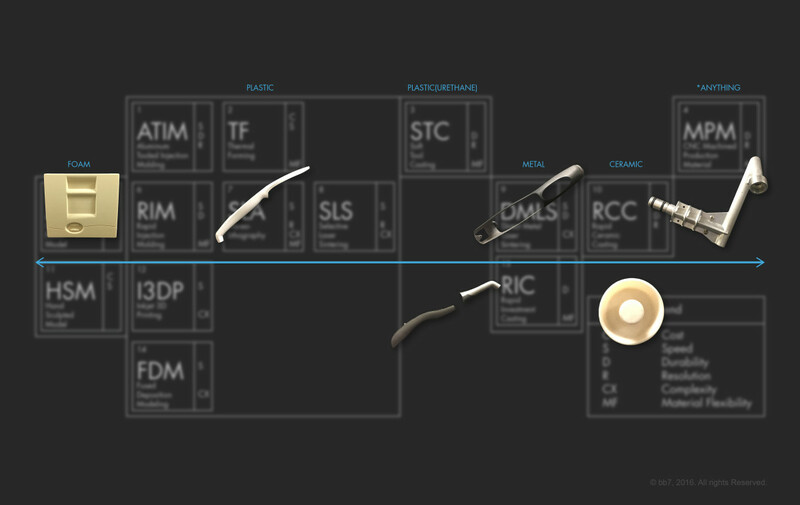 Each of the elements on the Table represents a prototyping method. For example, FDM represents Fused Deposition Modeling, which is a method of 3D printing that uses a print head that extrudes a thin bead of thermoplastic as the head moves around the build platform. In this method, the part is built one thin layer at a time. 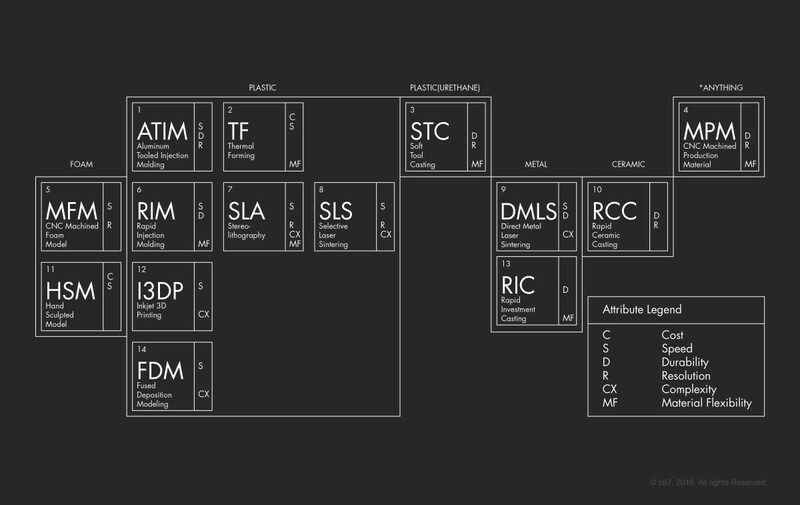 The current version of the table has 14 elements on it. The Table does not have every known prototyping method on it. We focused on prototyping methods that are both readily available and proven. The materials become harder to work with as you move from left to right. Material selection is important, and there are many factors to consider when selecting materials for prototyping including intended use for the prototype, final product material, and how the prototype will be finished (painted, plated, or other). For example, foam models are excellent tools for form studies. Meanwhile, plastics are perfect for representing something you might injection mold in production, and metals are great for parts that may be die cast. The elements in the Table are arranged vertically in rows based on the level of detail and robustness of the prototype. The elements towards the bottom have lower resolution and are not as robust as the elements higher on the table. The elements towards the bottom have lower resolution and are not as robust as the elements higher on the table. Determining the level of detail necessary in prototypes depends on their use. A prototyping method with lesser detail would be used to quickly prove a technology or a design. Intermediate detail is often necessary for internal communication, concept refinement and design evaluation. A higher-detail prototype is recommended for functional evaluation, tooling preparation and validation testing. In addition, each element has its key attributes highlighted. 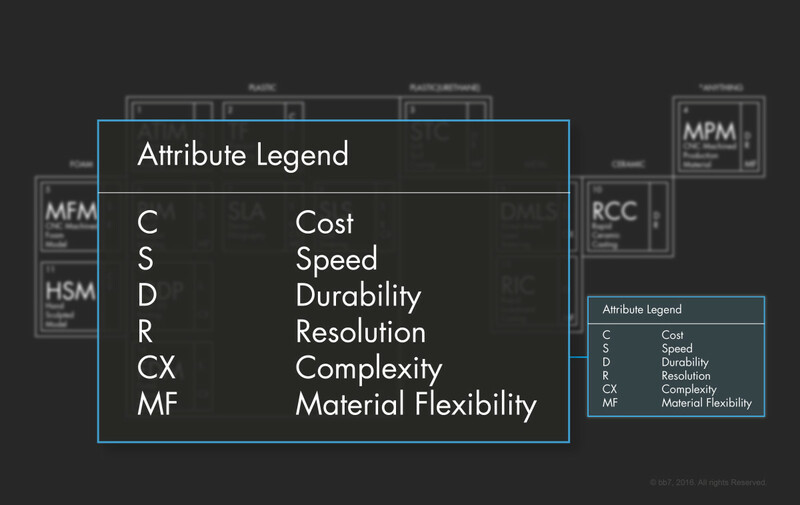 These attributes are explained in the legend. (C) Cost – The prototype cost will be low. (S) Speed – It will not take a lot of time to create this prototype. 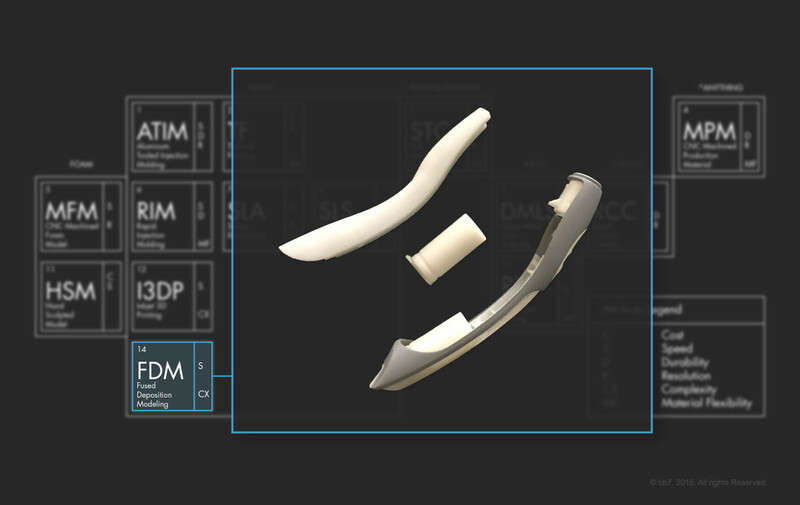 (D) Durability – This prototype will be durable and withstand stresses that a production part might see. (R) Resolution – These prototypes will have high resolution, very close to that of a production part. (CX) Complexity – These prototypes can have complex features. In some cases these features may not be able to be reproduced with other prototype or manufacturing methods. (MF) Material Flexibility – Prototypes can be made with many different materials using this process. If you’re looking for a quick form study, and don’t have a CAD database, you could start with a hand-sculpted foam model (HSM). These low-cost models can be made quickly by a skilled model maker and can give you a reference point for the state of your design. A hand-sculpted foam model (HSM) can be made quickly by a skilled model maker. 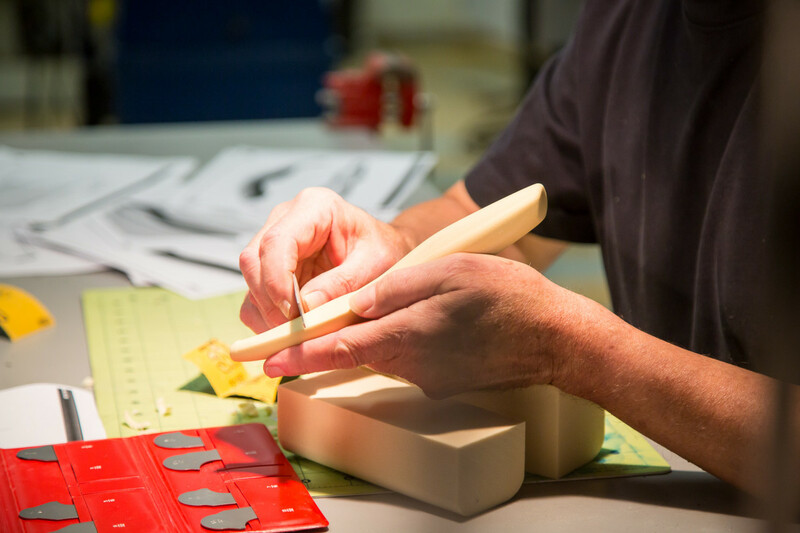 Here, our Model Maker, Mark Begin, sculpts a model for a dental device. If you’re looking for a moderately detailed model of a plastic part to conduct some initial testing, you should consider an SLS (Selective Laser Sintering) prototype. SLS prototypes can rapidly be made on today’s machines. They have high resolution and can support quite complex features. In some cases, SLS parts are being used in production because of their robustness and the ability to create features that cannot be made with any other process. There is no one-size-fits-all approach to prototyping. The scenarios are countless. Correctly determining your prototyping method saves money and time in the development cycle. Don’t waste resources on sophisticated prototypes when something simple will suffice. Alternatively, don’t choose a simple prototype when making important development decisions that require analysis of a functional model. When selecting a prototyping method, you need to understand your development teams’ expectations and the ultimate uses of the prototype. Strategically select the best option based on material needed, level of detail required for decision-making, project restraints, and prototype use. The world of prototyping is ever-changing. There are new processes and materials being created and refined every day, including the use of virtual reality in prototyping. As new processes are made available and proven, we will update the Table to keep this tool a valuable resource for you. If you ever find yourself stuck trying to figure out the best way to build a prototype or get your product to market, give us a call. We would love to help!